Good news to share with you guys. If you are reading this when I just published the blog post. I am now at the launch event of iPhone4 for Celcom now! Celcom launches iPhone 4 with the best plans that suit your personality. Including the exclusive White iPhone 4…Only for Celcom customers. Celcom Launched iPhone 4. Do you like White color? Celcom Exec has iPhone 4 packages that cater your personality and needs. Whether you are a social butterfly, gossip queen, web warrior or others, Celcom Exec has the perfect package for you. Choose from unlimited talk time, free SMS & MMS and data of up to 6GB. Get absolute assurance with Celcom Extended Warranty and insurance coverage. The12-month Extended Warranty will be in effect upon expiry of original manufacturer’s warranty and applies for i98, i148 & i248 plans on 24-month contract. The FREE 12-month insurance coverage covers attended theft, accidental breakage and liquid damage. Applies to i248plan on 12 and 24 months contract. Celcom is the 1st Telco to offer FREE INSURANCE coverage for its iPhone customers! So you can talk and surf away with absolute peace of mind! The best part of all, you can get this on Malaysia’s best network. Celcom providing the widest network coverage anywhere in Malaysia, offers the best network quality and gives you the richest web and video streaming experience with its stable connection. 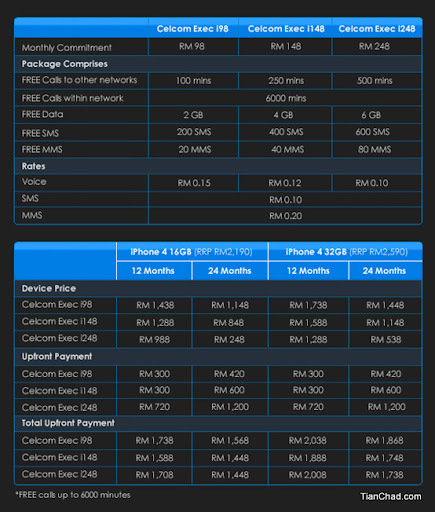 Why choose Celcom Exec iPhone Plans for your iPhone? • FREE SMS & MMS to all networks! • Get the iPhone 4 from as low as RM248! Just back from Celcom iPhone 4 Launch @ Menara Celcom and wanna share with you guys about the brand new smartphone package offered by Celcom. Mr. Chee Pok Jin, Chief Marketing Officer of Celcom Axiata Berhad. "Celcom has invested heavily in network infrastructure and we are set to cater to our customers' high demands especially for data. Now, with renewed and intense focus on our customers and their needs, we are confident we will dominate the smartphone ecosystem. The recent award of the much coveted Service Provider of the year Award by Frost & Sulivan for the third consecutive year is a testament that our strategic plans are on the right track. However, we will not rest on our laurels but will continuously improve upon our products and services to deliver the best of the best experience to our customers in Celcom Territory." said Chee"
The surprise of the day is that all media and invited Celcom customer are able to enjoy the Celcom iPhone 4 BUY ONE FREE ONE PROMO. Only for today and while stock last (for White iPhone 4). If you are very eager for the promo, go to Menara Celcom now and try to get the special queue umber from her.